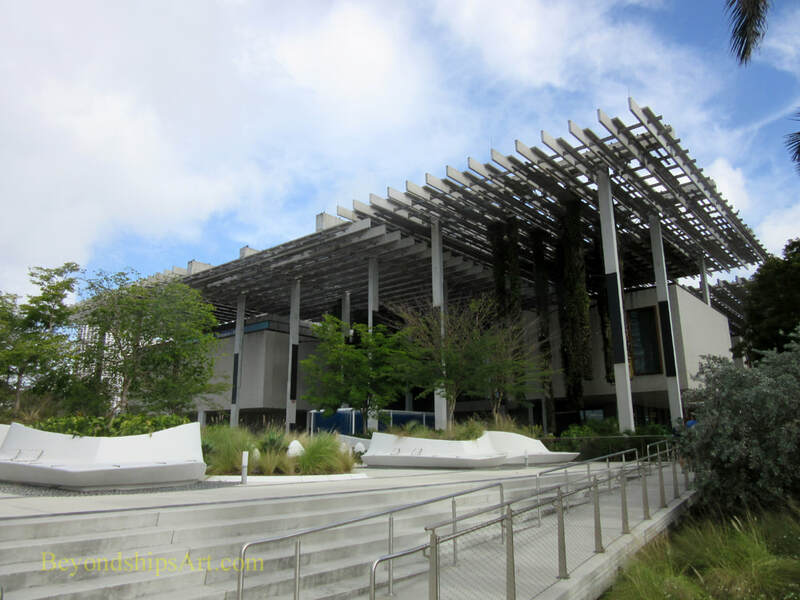 Surprisingly, considering the size and stature of Miami as a major city, Miami did not have a major art museum until the last part of the 20th century. In 1984, the Center for Fine Arts (“CFA”), a public-private partnership opened providing exhibition space where temporary, traveling exhibitions could be shown. A decade later, it was determined that Miami needed an institution that could not only show traveling exhibitions but which had its own permanent collection. 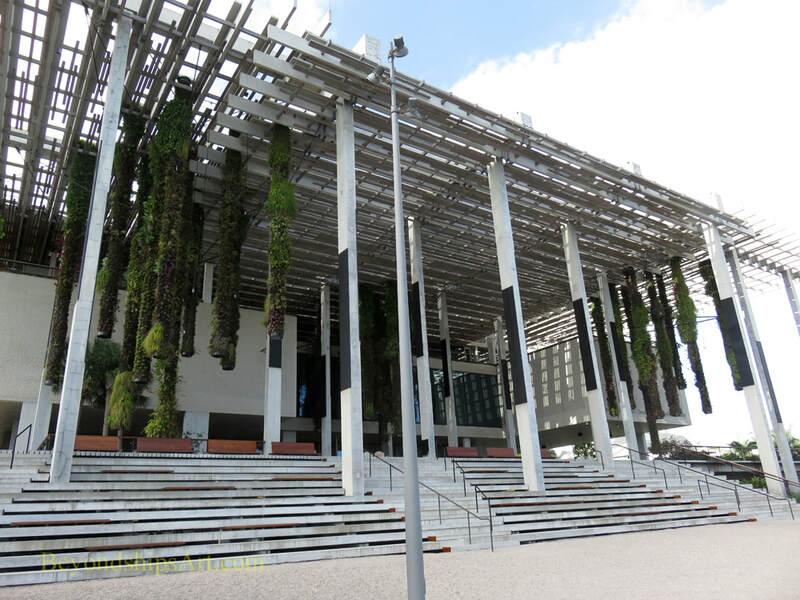 Therefore, the CFA became an entirely private institution under the name Miami Art Museum (“MAM”). The City of Miami also formulated a plan to transform a derelict 30 acre lot in downtown Miami next to Biscayne Bay into Museum Park. MAM would share this part with a science museum (now the Frost Science Museum). The City also provided funding to construct the new art museum. The Swiss architects Herzog & de Meuron were commissioned to design a building for the art museum. It was completed in 2013. In recognition of Jorge M. Perez's generous donations of both art and cash, MAM was renamed the Perez Art Museum. The Perez is situated in a nicely landscaped park next to the harbor. Indeed, from the park one can easily see the cruise ships lined up at the cruise terminals on Dodge Island. Next to the park is the American Airlines arena. Home to the Perez is a low lying building. The combination of polished concrete and wood avoids a brutal industrial look. Hanging from the trellis-like structure atop the roof are multi-story high cylinders with plants growing from them. This canopy also provides shade for the patios that surround the ground level. Large panels of glass on the outer walls of the building seek to make the interior one with the surrounding park. The building was designed both to be environmentally friendly and to withstand hurricanes. The building has won awards and is attractive. However, only a relatively small portion of the building can be used to display art. Much of the first floor is taken up with a reception area in which only a few works are displayed, a large shop and a restaurant. The third floor is devoted to offices and an educational center. An auditorium, which doubles as a large staircase, takes up more space. As a result, the exhibition space is limited to part of the first floor and the second floor. The museum uses a portion of its exhibition space for rotating themed-exhibits drawn from its permanent collection. The remainder is used for temporary traveling exhibitions. There is also a room that is dedicated to concept art installations, which change over time. Outside, there is a sculpture garden. The Perez focuses on 20th and 21st century modern and contemporary art. In keeping with Miami's location as a crossroads of the Americas, there is an emphasis on art from the Western Hemisphere but not exclusively so. The permanent collection includes works by internationally known artists but it is still a young, developing collection. For information about visiting, see the Perez Art Museum's website. 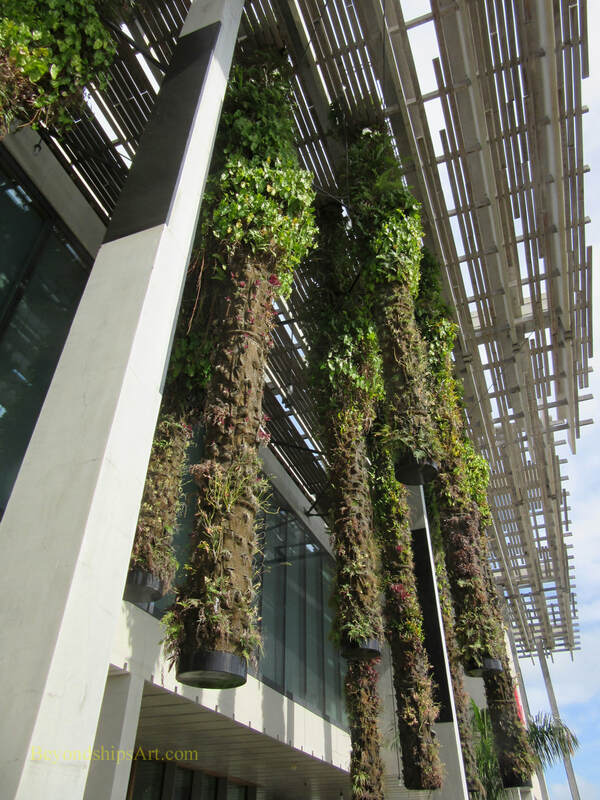 Above: Huge hanging gardens of live plants are suspended from the Perez's trellis-like canopy. ​Below: The steps on the side of the museum are often used as seating for outdoor concerts and performances. Review: "Grids: A Selection of Paintings by Lynne Golob Gelfman"